This was one of the most exciting Olympias in recent history. At the end of the second round, JAY CUTLER was 6 points in front of Ronnie – but at the evening show, Ronnie posed his heart out to win the final two rounds. It was a close call, but the Master pulled it off. Then tension on stage is clearly mirrored back stage in both of our exciting pump room DVDs. 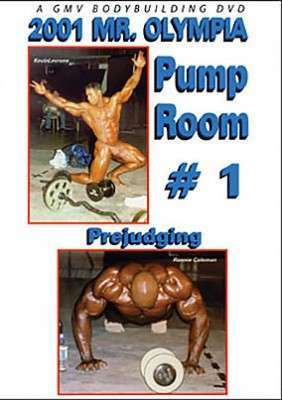 Get up close and personal at the prejudging pump room. It’s every man for himself in these tense minutes before they go out on stage to do battle for the Mr. Olympia crown. Shot with 2 cameras, just prior to rounds 1 and 2 of the Prejudging. You will see all of the competitors in the DVD with much footage on Kevin Levrone, Craig Titus, Ronnie and some of the other big names. See rare footage of Tom Prince. All of the men shown are listed in the RESULTS below. 10. SHARI ‘KING’ KAMALI USA.